The ELM327 Wifi adapter allows you connect your iPhone, iPad or Windows laptop to your vehicle and receive real-time data from your vehicles computer. This will allow you to view your vehicles live MPG, sensor data and trouble codes associated to the check engine light. The ELM327 adapter is compatible with OBD2 compliant vehicles which includes most vehicles newer than 1996. This tool itself is not complicated to use and only needs to be attached to the port located directly below your steering column. The Wifi Elm is only recommended for use if you are wanting to connect it to an iPhone or iPad. Otherwise we recommend you use the Bluetooth ELM327. The biggest down-side to connecting over a Wifi connection is that it will disconnect you from any existing Wifi internet connection. With an iPhone or a 3G iPad, this will likely not be a problem because your internet should resolve over your 3G or 4G cellular data connection. Otherwise, the Wifi model offers great performance and a good overall user experience, especially for iPad users where Apps with outstanding graphics are available. Though this is all very dependent on whether you are using the device for professional or entertainment purposes. For professional purposes the Bluetooth ELM327 with Logging software on a laptop would be recommended. The Wifi signal broadcasted by the ELM327 reaches only about 5 feet. This means that if you want to diagnose a vehicle from outside or even a short distance away, your connection will be limited to almost non-existent. One way to increase the distance you are able to transmit the data is to use an OBD2 extension cable however this may only buy you a few feet. For the Wifi ELM327, expect to spend some extra money on apps. There is limited support as far as free software goes however over the past few years many new apps have been created. Though other options may be available, we recommend an app called DashCommand for anyone using iOS, MoviPro for OSX and ScanMaster-ELM for Windows. 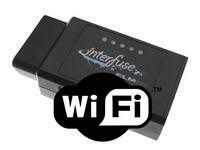 The ELM327 Wifi is compatible with the iPhone, iPad, Mac OSX, Windows XP, Vista, 7 and 8.1. Windows compatibility is limited to only a few applications since most Windows users use the Bluetooth or USB ELM. The scanner is compatible for all OBD2 compliant vehicles. To check to see if your vehicle is compliant simlift up the hood of your vehicle and check for a sticker that says 'OBD-II Compliant'. In general 99.9% of all vehicles manufactured after 1996 will be OBD-II compliant, a few foreign makes are not. Purchasing an ELM327 from a reliable source is critical. Some suppliers sell diagnostics that may come with faults, defects and without instructions. This can make for a frustrating situation that can have you trying for hours to connect to a device that was defective from the start. To avoid this situation we recommend to purchase your device directly out of our store, these items have a long standing track record of being reliable and dependable and include setup instructions. For a more in-depth analysis of the ELM327, please check our ELM327 OBD2 Interface Adapter Guide.